Screenwriters: Nicholas Stoller, with additional material by David Soren. Based on the books by Dav Pilkey. Previewed at: Event Cinemas, George Street, Sydney, on 5 September 2017. Two mischievous, grade four school-mates, George (voiced by Kevin Hart) and Harold (voiced by Thomas Middleditch) are best friends, collaborating both in class and after school, when they work on their comic creation, Captain Underpants, an ungainly superhero. When the mean-spirited school principal, Mr. Krupp (Ed Helms), becomes fed up with the boys’ pranks and announces that he’s going to put them into separate classes, George and Harold see that desperate action is needed or their friendship is doomed. The pair hypnotizes him and convinces him that he is, in fact, Captain Underpants, whose costume is comprised only of a pair of Y-fronts and a cape. Soon they learn that a splash of water will return the head master to his usual unlikable self but a snap of the fingers can change him back again. Needless to say, this leads to all manner of crazy mayhem and adventures. 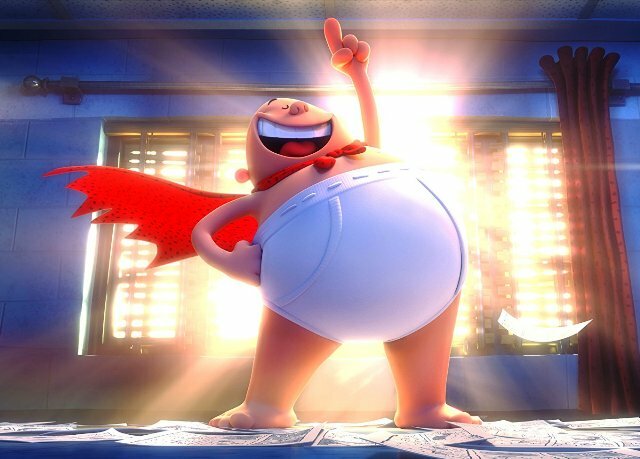 Captain Underpants: The First Epic Movie is a delight, tapping successfully into the sheer joy of being a child and relishing in the potty humour and fart jokes that kids of that age find hilarious. At the same time, screenwriter Nicholas Stoller has included much grist for the mills of older, adult ‘kids,’ too. There are a great many laugh-out-loud moments in his deft plot and a lot of pleasure to be had from George and Harold’s great friendship. It’s simultaneously sweet and funny. The CG animation, done out-of-house in Montreal rather then in L.A.’s Dreamworks headquarters, is clean and crisp and incorporates scenes that include other forms of animation such as flip-books and even a sock-puppet sequence. Pilkey has said of his characters, “George and Harold were usually responsible kids. Whenever anything bad happened, George and Harold were usually responsible.” If you’re slightly irresponsible and still able to remember your schooldays, you’ll be more than happy to share Captain Underpants: The First Epic Movie with your own little monsters.